Businesses that use TSheets for labor costing invoice, on average, 11% more. * Stop undercharging, and get the most out of every invoice with TSheets — now inside QuickBooks Online! Employees can clock in and out, take breaks, and track time for different jobs. Know who’s working and where, and gain insight into your mobile workforce. Tablet-optimized time clocks snap photos of employees clocking in and out. 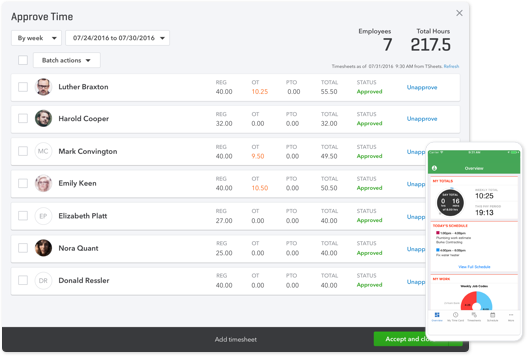 Create, update, and manage employee schedules. Alerts keep everyone updated. 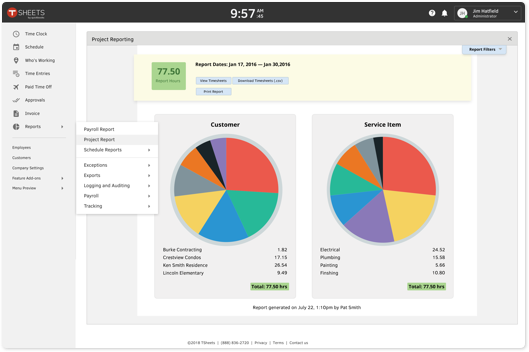 Increase profitability and prepare for payroll with labor cost insights in real-time. Time is money. Start saving both! A recent survey asked small business owners how often they find errors on employee timesheets. ** 56% find errors on a fourth of employee timesheets. Another 6% find errors on all employee timesheets. Are you spending time and money on systems that aren’t working? *Based on a survey of 924 businesses that use TSheets for payroll/invoicing and reports savings/billing more. On average, they report reducing gross payroll costs by 6%, reducing the time it takes to run payroll by 3 hours, and adding 11% more billable time to their invoices. Internal survey conducted by TSheets in January 2018. **The survey of 500 U.S. business owners was comissioned by TSheets from Google Surveys in October 2017. The participants were identified independently by Google from a pre-selected audience panel.